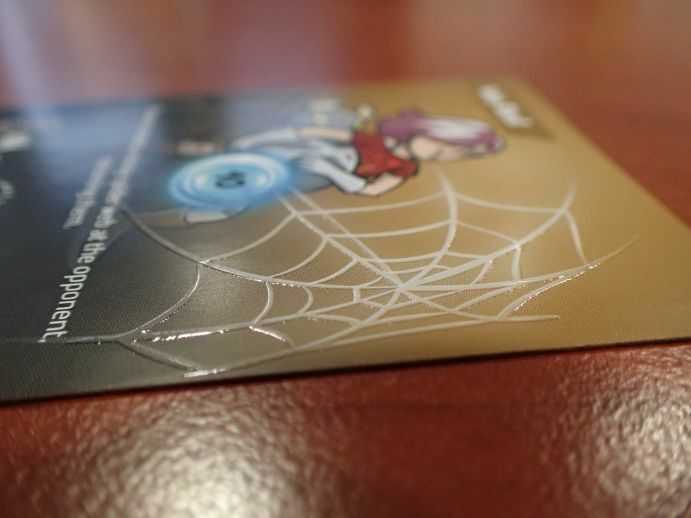 FusionPlay – Heroes is the first mobile NFC card game. It's played with physical cards, each containing a Near Field Communication chip. These chips enable communication between the playing cards and a smartphone. As soon as you slide a card under the smartphone, it appears on the screen of the phone. Then the app processes the actions and visualizes the results. NFC is used to enable the fast-paced gameplay. Reading QR codes via camera would be slow and awkward. With the technology of the FusionPlay Cards, you just slide them under the smartphone, and they appear on the screen immediately. This makes the whole game experience smooth and fluid. Instead of going through the hassle of getting the cards recognized (like with barcodes, etc. ), NFC reading is so fast and reliable that it becomes fun to play around with scanning the cards. But that is just one reason why NFC was chosen. The fundamental reason why playing cards were combined with an app via NFC was to get the best of two worlds: real haptic and social elements of traditional card games, but also the complexity and ease of use of smartphone apps. The app takes care of storing data, calculating everything, and minding the rules. A big amount of game markers would be needed to symbolize the status effects, buffed attributes, combostack, etc. This would also slow down the gameplay drastically. Additionally, your brain would get fried by doing all the math. By having the app communicating with the cards, you as the player can focus on your strategy and on your opponent. And there is one more important thing: Unlike other smartphone apps and modern smart items, the 'FusionPlay - Heroes' app runs only on your smartphone. It doesn't want to send your data to a cloud, and it doesn't want to have access to your current GPS position, your emails, and your whole address book. It also doesn't require you to create yet another unnecessary account that you neither want nor need. The game itself is a duel between two players, like a digital homage to beat 'em-up games of the 16-bit era. Each player chooses one of the 4 heroes and uses the heroes' unique skills to win the battle. The game is fast paced and always motivates to play "just one more round". All components are pocket sized, so the player can always have them with them. 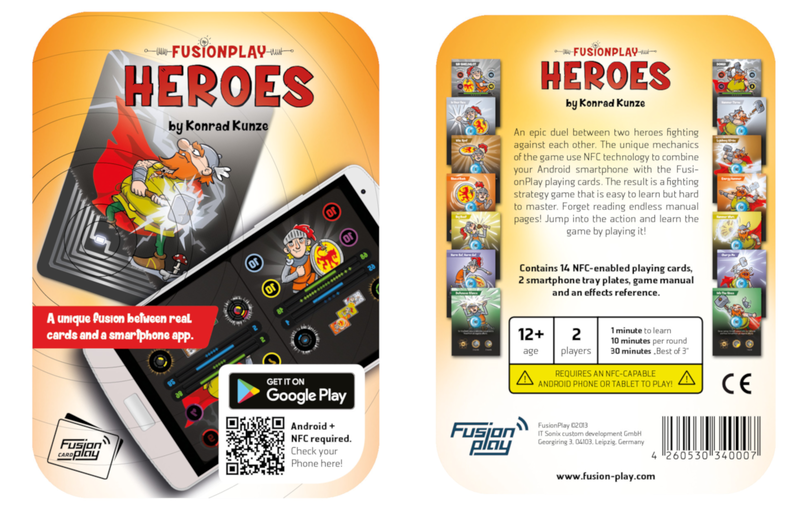 FusionPlay Heroes, the first mobile NFC card game, is now released! FusionPlay – Heroes is the world’s first mobile NFC card game that combines traditional playing cards with the digital realm. 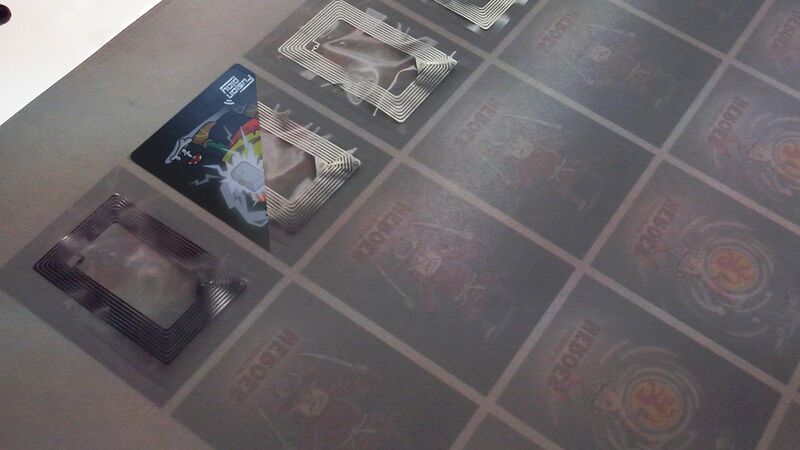 The high-tech playing cards with effect prints have NFC chips built in. This NFC chips enable them to communicate with a specially designed smartphone app. The players just slide the cards under the smartphone and they immediately appear on the screen. The app then uncovers the played cards and then calculates and visualizes the results. The app controls the game flow and cares about data keeping and status visualization. The players can focus purely on their strategy and experience a uniquely fast but complex card game experience. The app itself runs only on the smartphone it is installed without requiring the player to create a specific account or having an online connection. The game is a duel between two players that each select a hero and then fight against each other. It is an homage to beat ´em games of the 16-bit era of video games. Each hero has unique abilities and provides different strategies for playing. By merging the social experience of traditional card games with the possibilities of apps and video games, a whole new gaming genre is born. The game is fast, fun and very tactical. It is really easy to learn but hard to master. 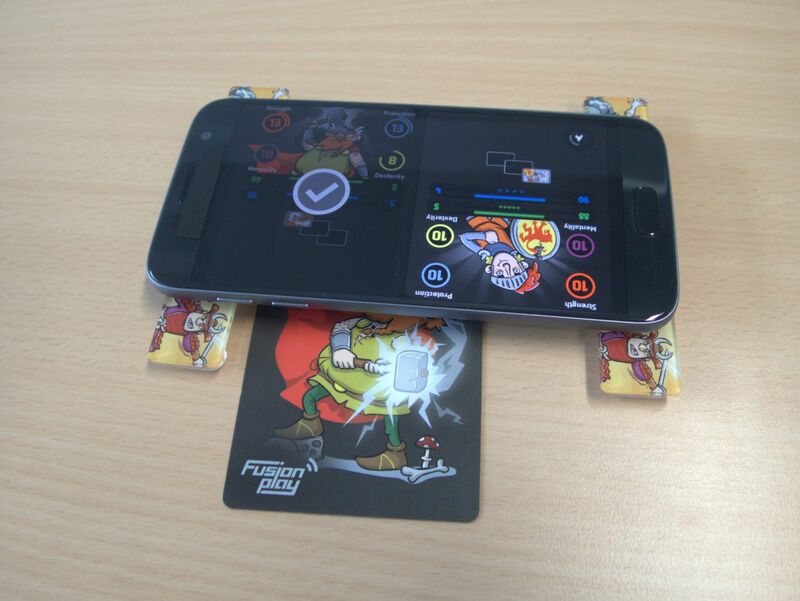 Our latest video shows, how FusionPlay Heroes, the first NFC card battle game is played. FusionPlay Heroes - Release trailer revealed!